You know Thali at West Street Market for its organic north Indian cuisine. But did you know about the $9 bowls? The actual meaning of “Thali”? The new Thali Lounge? There’s a lot going on around here, so let’s bring you up to speed. Okay, the $9 bowls have been a staple at Thali for ages, but if you aren’t a Thali Facebook follower, it’s understandable if it maybe slipped your mind. You can snag one every Tuesday and Sunday, and you’ll probably want to take steps to make that happen immediately. Following along on social media is an easy way to get tasty menu updates and make immediate plans for dinner (no matter what time it is). And then there’s the Thali plate, a set daily menu. While the ingredients and flavors change, they’re always vegetarian (and amazing). And if you want it vegan or gluten-free, just ask! Plus, everything is fully organic and Thali has an admirable commitment to sustainability and the local food movement. 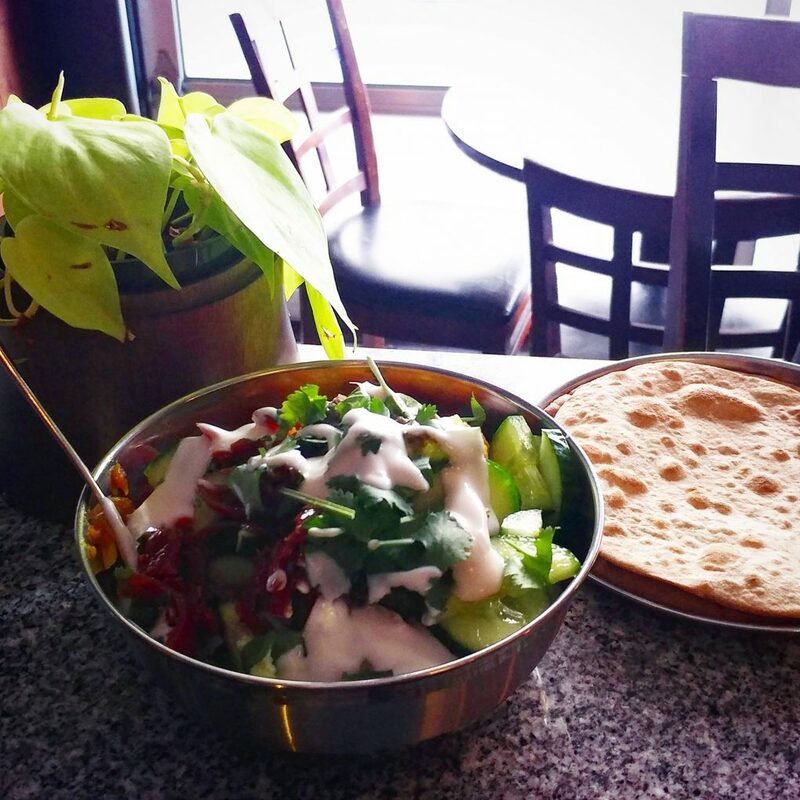 Good food begins with being good to the ground, and that’s something Thali fully embraces. Thali is the Indian name for a round platter that’s used to serve food. The term can also be a reference to an Indian-style meal that features different dishes served together on a platter, which is what you’ll enjoy here at Thali. These Thalis are a kind of refined combination platter complete with multiple veggie curries, lentil dishes, raita, rice pilaf, chutney, handmade roti, and dessert. Goodness! Formerly Esoteric, Thali’s wine bar has been reimagined as the Thali Lounge. It’s transitioning to a full bar featuring specialty cocktails and elixirs, and you can already enjoy teas, desserts, beer, and sake. That’s in addition to its fabulous curated selection of biodynamic, organic, and sustainably-sourced wines. And yeah – we said desserts. Come in for drinks and don’t skip the pistachio cookies, black sesame matcha cookies, or cashew cheesecake. We get it. Check out Thali on Facebook for little teasers to get your mouth watering, and then swing by for a $9 bowl, a Thali plate, or that killer wine-and-dessert combo. Stay tuned, too. The transition to that full bar should be complete by summer 2019, and we’re anticipating the Thali Lounge to be quite the hangout when the weather warms up! There’s no better time of year for dining alfresco, so grab something to go and enjoy the sunshine. Previous post Have You Been to Maya’s Yet?